Psst... I am cheating with this one. Put together haphazardly before I left for Shanghai last week with the intention of finishing up my lemon curd from the Lemon Meringue Cupcakes. I then realised that it didn't quite help to clean out the clutter in my fridge because to get this, I found myself making up a huge batch of Pierrre Herme's sweet tart pastry dough..... Consolation is that this keeps well for a couple months in the freezer and I suppose friends and colleagues will be happy to hear that I could potentially whip up an Apricot Chocolate/ Orange tart or 2 in the coming weeks for them.... or I could try to work on something gorgeous with strawberries... it is raining strawberries here in Seoul. I am lucky to be in the middle of what appears to be the peak season for strawberries in Korea. The fruits are a glossy garnet red (unlike the pale hue that I typically see for imported Korean strawberries in Singapore), sweet and flavourful with a tender bite. I am setting aside luggage space for 2 punnets to be brought home! I had chosen to make these into petit fours, tiny bite sized treats that can be devoured in one single mouthful. I am a fan of miniature sized sweet treats. Sweets, I feel, are best enjoyed in small doses. Their ability to delight is indirectly proportional to their sizes. A fist sized cupcake or a 2" macaron has little appeal for me. Hence, I leave you this for now... my next teleconference's calling. They are adorable..love the reminder of this sweet dough..I have made dorie's never his..I must one day! Yes, very pretty :) Can't wait to see your next post! Beautiful pastries. Love your food photo. Soft lighting and beautiful. What?! No shots of the insides?? Shirley!!! Heheh... this is my all time favorite non-chocolate dessert. haha, Pickyin - I finish the photos just a few hours I left for the airport... didn't occur to me to cut it up. Next time! @Mei Teng, thanks for your compliments. However,I am not happy with the photos here and I have a feeling they will be rejected by FG and TS. They are so pretty! It's great that you find time to bake even though you're so busy travelling! I am a fan of petit fours too. They look so adorable & pretty. I love how the things you make haphazardly come out beautiful and bakery-worthy! Looks delicious. u count this as cheating? LOL U did a great job!! Sometimes, i actually use store bought tarts shell! Shirley, these are gorgeous and I do love one mouthful type of desserts. You've got me inspired already so I will make some in the next week or two. 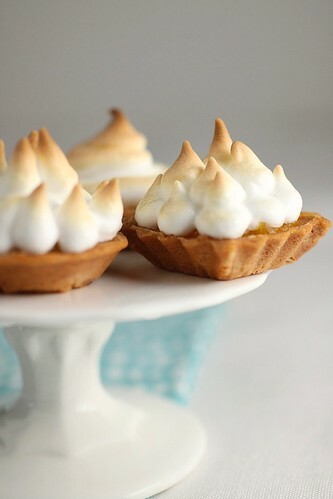 These little tarts are just beautiful especially with the little white meringue peaking out of it. Like you I like cute little treats like this. 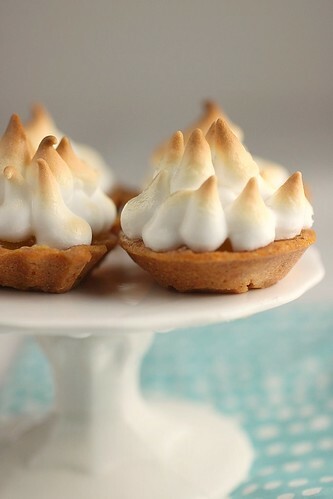 I love pop size desserts too and these little ones looks simply inviting. Have fun in Korea and load up all the strawberries. i like dessert in little size too. Looking more desserts from you. Take care and have fun in Korea. Mmm...these look delicious- and so cute! I'm so jealous of your strawberries- I haven't seen them around here for ages! This has got to be the best looking dessert I have ever saw. So simple. Thanks for sharing. LOL! K, look forward to something strawberry from you in 2 weeks' time then. Take care lar, busy lady. wow Ain't those cute and pretty! Lucky you! Strawberries here are still too sour. 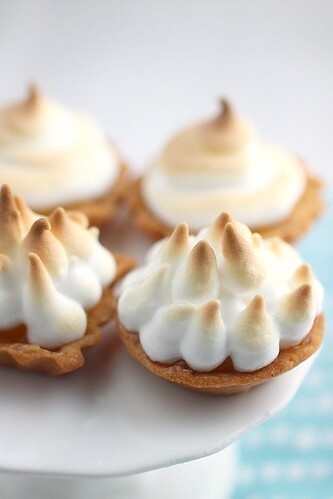 The little meringue tarts are super cute! these are pretty and cute, looks like those serving in high tea. These are absolutely gorgeous, Shirley! 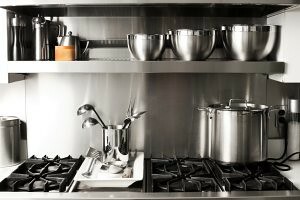 I envy your mini tart pans...so cute! these are gprgeous. I love lemon meringue. gorgeous pics!